Yesterday I pointed you to Leah Libresco's essay over at Nate Silvers' 538 blog. In her article "The Sun Is Always Shining In Modern Christian Pop" Leah described the differences in the lyrical content of old Christian hymns with the content of contemporary Christian pop songs. These differences struck Leah as she attended a shape-note hymn sing in her town. Which fascinated me, because while Leah called me to weigh in on the theological issues raised by her analysis, I had another connection with her research as well. I grew up with shape-notes. If you don't know anything about shape-notes let me introduce you. While the origins go further back, shape-notes were introduced in America in 1801 as a music education tool. The idea was simple: Help the person reading the music know what note to sing not just by where the note was located on the musical staff, but also by the shape of the note. As you know, in conventional musical notation the shape of the note is uniform, an oval. But in shape-notes, the oval could be a diamond, square, triangle, and so on, depending upon the note. More on this in a minute, but in America there have been two main shape-note systems, the four-note and the seven-note. Shape-notes became hugely popular in the American South for sacred hymnody and congregational singing. There are two main shape-note traditions for congregational singing in the US, each corresponding to the four- and seven-note systems. The four-note system is the system used by Sacred Harp. Sacred Harp singing is a form of a cappella congregational singing that uses shape-note hymnals. Sacred Harp singing originated in New England, but reached its peak popularity in the American South during the mid-1800s to mid-1900s. Interestingly, Sacred Harp is experiencing a resurgence today among younger audiences in urban settings. For more about Sacred Harp watch this trailer for the Sacred Harp documentary "Awake My Soul," and this video about the history of Sacred Harp, its method of singing and its recent renaissance. 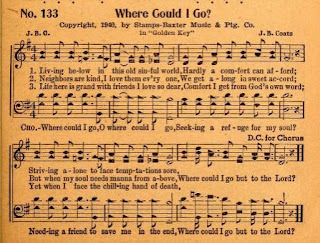 Outside of the four-note Sacred Harp tradition, there is the seven-note tradition found among some Protestant congregations, mainly Southern Baptist, Primitive Baptists and some Free Methodist and United Pentecostals. And almost all of the non-instrumental Churches of Christ. My faith tradition. The hymnbooks of these denominations, according to Wikipedia, represent the largest branch of the shape-note tradition. And given that the Churches of Christ universally used shape-notes, I consider myself to have grown up at Ground Zero for shape-note congregational singing. I've done a bit of digging into the history of shape-notes in Church of Christ hymnals. I'm a psychologist and not a musical historian, but here's the history as best as I could construct it. The first shape-note hymnal (or one of the earliest) in the Restoration Movement was The Sacred Melodeon, published by Amos Sutton Hayden in 1848 (PDF here). Trouble was, Hayden was on the instrumental side of the Restoration Movement. That debate, between the instrumental and non-instrumental (a cappella only) congregations in the Restoration Movement, eventually led to a split in the movement, with the non-instrumental Churches of Christ being recognized for the first time in the 1906 US Census as a distinct denomination. After the split with the instrumental congregations, the Churches of Christ began to publish their own hymnals. The first of these was Christian Hymns, published in 1889 by the Gospel Advocate. Christian Hymns did not use shape-notes. Shape-notes returned and came to dominate Church of Christ pews with the publication of Great Songs of the Church, by E.L. (Elmer) Jorgenson. Great Songs of the Church is considered to be the most influential songbook in the Church of Christ tradition, but the original 1921 edition did not have shape-notes. But shape-notes were wildly popular in the American South, not only with the Sacred Harp crowd, but also with the church and community singing events held throughout the South in the early 1900s. A huge influence upon these singing events was the Stamps-Baxter Music Company. Formed in 1924, Stamps-Baxter would arrange and publish annual paperbacks to be used for these church and community singing events, often called singing "conventions." 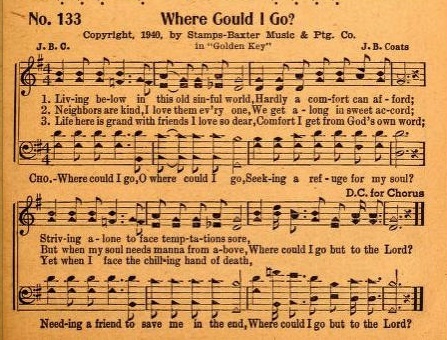 Many country, blue-grass and gospel standards were first published by Stamps-Baxter in these annual paperbacks, songs like "Just a Little Talk With Jesus," "Farther Along," "If We Never Meet Again," and "Victory in Jesus." And most importantly for our subject matter, these Stamps-Baxter hymnals used the seven-note shape-note system. 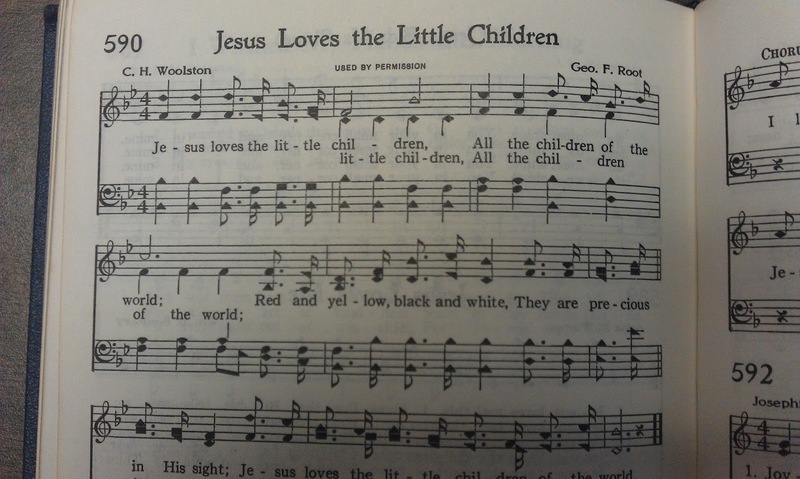 Pressured by Southern demand for a shape-note version of Great Songs of the Church, Jorgenson responded. 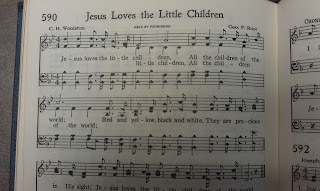 In 1925 Jorgenson published a shape-note version of Great Songs of the Church, reintroducing shape-notes to the Churches of Christ. Great Songs of the Church (in its later editions) is the hymnal I grew up with. Other hymnals followed. Each one, very often, triggered by doctrinal squabbles in the movement. For example, in the first half of the 1900s the Churches of Christ were roiled by controversies regarding premillennialism. Jorgenson endorsed premillennialism, making his songbook suspect in the eyes of those who rejected the doctrine. In order to have a hymnbook free of any whiff of premillennialism, L. O. (Lloyd) Sanderson and the Gospel Advocate revised and republished Christian Hymns. And in order to compete with the popular Great Songs of the Church, Christian Hymns II also used shape-notes. Another influential songbook in the Churches of Christ, responding to other doctrinal issues going on that the time, was Sacred Selections, published in 1956 by Ellis J. Crum. Sacred Selections also used shape-notes, and was a favorite among very conservative Churches of Christ. Sacred Selections is notorious for re-writing the lyrics of classic hymns to make them conform to "Holy Writ" (i.e., Church of Christ doctrine). Beyond the "Big Three" hymnbooks in the Churches of Christ--Great Songs of the Church, Christian Hymns and Sacred Selections--all of which used shape-notes, another popular hymnbook was published in 1971, Songs of the Church by Alton Howard. Songs of the Church also used shape-notes. In short, all the major hymnbooks of the Churches of Christ tradition have used shape-notes. No matter what Church of Christ you visited, even if you were pulling a different hymnbook from the pew, you were always singing with shape-notes. To be raised in the Churches of Christ meant a capella singing, and growing up shape-note.